View of the 15th century Water-gate on the east side of the Cathedral Close in Norwich. It has a wide segmental arch and then a pedestrian archway. There used to be a canal running through the gate, which was built by the monks to bring stone and other materials to the cathedral. It was filled in c.1780. 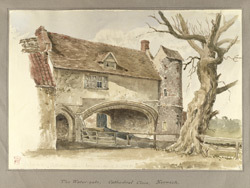 Next door to the Watergate is the Ferry House, built in 1647 of flint and brick.